Using your trusty Owner's Manual you may have noted that changing-out the crankcase vent filter (CCV) is a required service at the 67,500 mile interval. Further, for those 2007.5-2012, 2500/3500 pickup truck owners [the non-diesel exhaust fluid (DEF) style aftertreatment] there is also a "clean the exhaust gas recirculation (EGR) valve and cooler service" required. The '07.5-Current Cab and Chassis trucks and '13-Current 2500/3500 use the DEF exhaust aftertreatment. Looking closely at their Owner's Manuals reveals that a CCV filter change is also required at 67,500 miles, However, the cleaning of the EGR valve and EGR cooler is NOT a requirement. We asked the folks at Cummins and they responded that you may wish to include the cleaning, but it is typically not needed until the second crankcase vent filter change. They did suggest an inspection of the EGR valve. "Sooty/dusty is good, shellac/crusty needs to be cleaned." If the valve is shellac/crusty, don't skimp, go ahead and do the entire EGR system cleaning. If you price these parts over-the-counter at Mopar the cost is $180 plus $40 for the cleaning solution. We would suggest using the Cummins equivalent parts for the gaskets and filter that are needed and we'd also suggest using "Purple Power" as your cleaning solution. The folks at Truck Trend magazine did a comparison of several cleaners and Purple Power was their winner. They found the Mopar cleaner to be one of the least effective. Freddie Frugal knows that if you are going to spend time cleaning the EGR valve and EGR cooler, that you'll remove and clean the intake air horn that the EGR valve is bolted to. 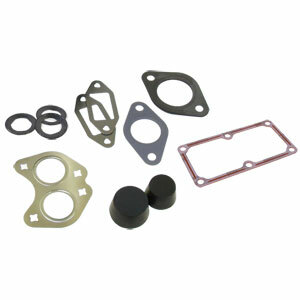 The replacement gasket for air horn-to-intake manifold is 4940849 and it is included in our EGR Cleaning Kit. Additionally, our kit has thorough instructions for removal of the parts and tips on best method(s) for cleaning. Finally, Freddie Frugal adds two rubber plugs for the ends of the EGR cooler assembly so you don't waste cleaning fluid. Fill up the cooler, cap it off, and soak it overnight. Use the caps to shake the cooler with the cleaner inside. The 6.7 EGR cleaning kits contained everything I needed to perform the job easily and efficiently. The kit was well packaged to prevent gasket bending and breakage, and it was received very quickly. The direction supplied with the kit were detailed enough that even a non-gearhead could perform this job with ease. Everything that was needed for the job at a great price.